As we all know, FFXIV can be played on both PS3 and PC. Then you may want to know how to make a PS3 to work on a PC. 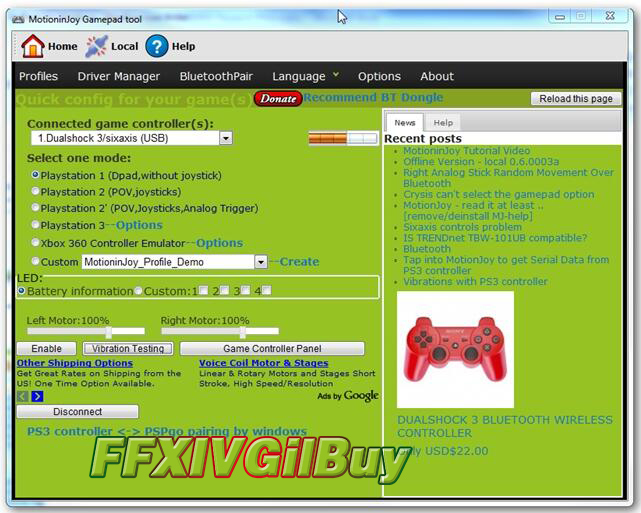 Firstly, you need a Playstation 3 controller, a set of drivers and software, a USB cable to connect your controller to the PC. Then access to http://www.motioninjoy.com/download to download the latest version of MotioninJoy. After the installation is completed, you will see a DS3 Tool shortcut on your desktop. Open it and you will see below information. 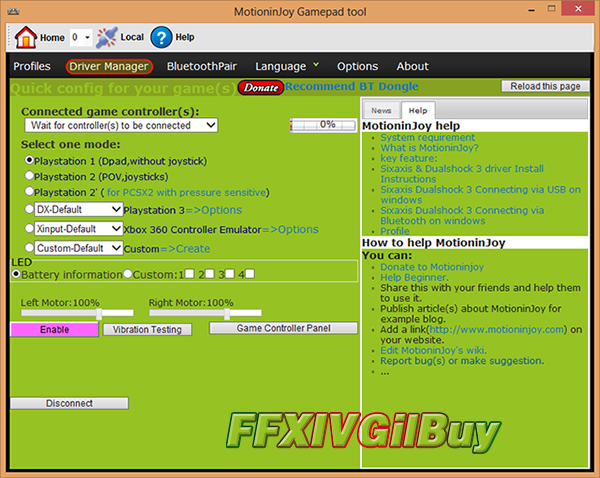 Insert your PS3 controller and click on “Driver Manager” at the top of the window. If you use bluetooth to connect, it is suggested you disconnect other controllers. Then clock on ‘install all’. 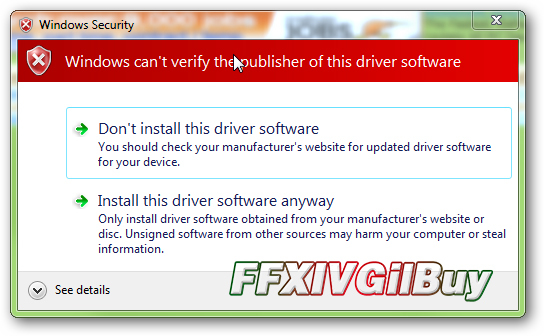 When you see the warning message about the driver on screen, just click install. When you see the words “ SUCCESS: Install completed”, everything is perfect. Now your controller can work in wired mode. Then you can customize your controllers with “Profiles” window. At last, please remember to click on ‘Enable’ to apply the changes. If you want to use your controller in wireless mode, just click on “BluetoothPair”, and you will see below information. If there's no Bluetooth adapter listed in the "Bluetooth Adapter" section, then your adapter isn't compatible. With your controller plugged with the USB cable, select the Bluetooth adapter, then your Dualshock 3 controller and click “Pair Now”. Wait for a few seconds, and you can unplug the USB cable and play wirelessly. Some other problems you may encounter, and you can refer to below method and have a try. 1. I tried to pair my controller with my bluetooth adapter, but when I unplugged the cable, it keeps flashing. Try to turn your controller off (hold the PS button for a while) then turn it back on. 2. Why are the LED on my controller indicate I'm the fourth (or third or second) player, when there are no other controllers plugged ? By default, the LED will indicate the battery level. 4 is nearly full, 1 is nearly empty. I'll update this guide, do not worry. I'm just posting it now to avoid losing all my work.